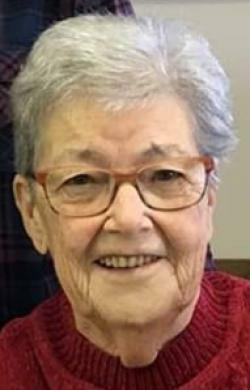 With her loving family by her side, Mavis Smith of Perth-Andover, NB, formerly of Arthurette, NB, passed away peacefully at Hotel Dieu St. Joseph Hospital on March 31, 2019. Born in Lerwick, NB, on January 21, 1937, Mavis was the daughter of the late Henry and Lena (Goodine) McAllister. She leaves behind her daughters, Carol Demmings (Kerry) of Aroostook, NB, Janetta Barclay (Malcolm) of Oak Bay, NB, Barbara Bowmaster (Dale) of Odell, NB; five grandchildren; four great grandchildren; two great great grandchildren; her sisters, Myrtle Chambers of Manchester, CT, Dorothy Smithkey of Perth-Andover, NB; her brothers, Kenneth McAllister (Cecelia) of Moncton, NB, Arnold McAllister (Margaret) of Lethbridge, AB, Aubrey McAllister of Port Hardy, BC; along with numerous nieces and nephews. Mavis was predeceased by her parents; her husband, Donald Smith; her brother, Ellery McAllister. Mavis was a very social lady and enjoyed playing bingo or any card games with her friends every opportunity she had. She had a deep devotion for her family and truly enjoyed every moment she spent with them. However, her grandchildren, great grandchildren, and great great grandchildren held a very special place in her heart and were a true joy for her. Respecting Mavis' wishes, there will be no formal funeral service held. A private interment will be held at the Arthurette Baptist Cemetery at a later date.